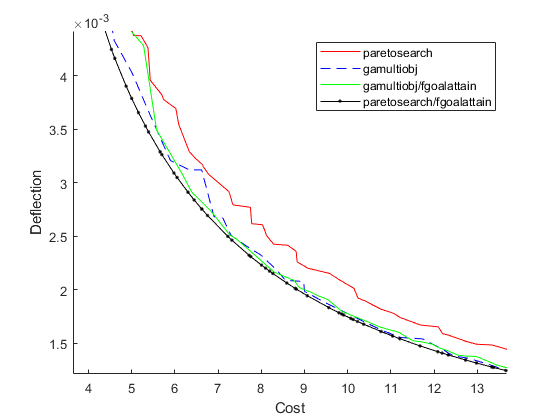 This example shows how to examine the tradeoff between the strength and cost of a beam. Several publications use this example as a test problem for various multiobjective algorithms, including Deb et al. and Ray and Liew . 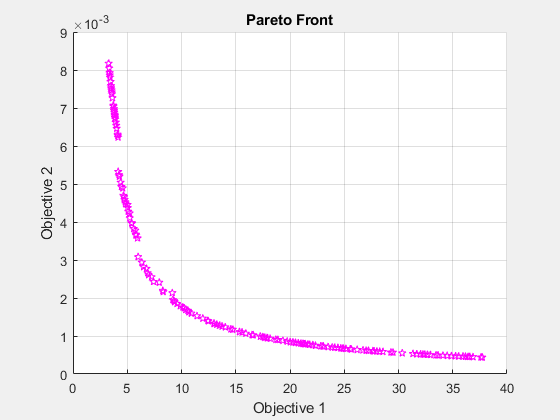 For a video overview of this example, see Pareto Sets for Multiobjective Optimization. The following sketch is adapted from Ray and Liew . This sketch represents a beam welded onto a substrate. The beam supports a load P at a distance L from the substrate. The beam is welded onto the substrate with upper and lower welds, each of length l and thickness h. The beam has a rectangular cross-section, width b, and height t. The material of the beam is steel. The two objectives are the fabrication cost of the beam and the deflection of the end of the beam under the applied load P. The load P is fixed at 6,000 lbs, and the distance L is fixed at 14 in. F2(x)=Px4x33C, where C=4(14)330×106≈3.6587×10-4 and P=6,000. The problem has several constraints. 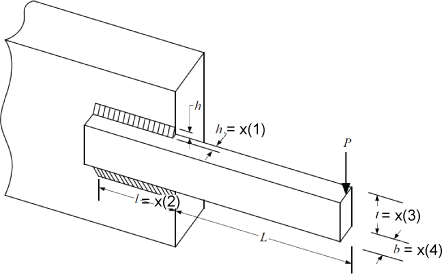 In summary, the shear stress on the welds has the constraint τ(x) <= 13600. The normal stress σ(x) on the welds cannot exceed 30,000 psi. The normal stress is P6Lx4x32≤30×103. The buckling load capacity in the vertical direction must exceed the applied load of 6,000 lbs. Using the values of Young's modulus E=30×106 psi and G=12×106 psi, the buckling load constraint is 4.013Ex3x436L2(1-x32LE4G)≥6000. Numerically, this becomes the inequality 64,746.022(1-0.0282346x3)x3x43≥6000. The objective functions appear at the end of this example in the function objval(x). The nonlinear constraints appear at the end of this example in the function nonlcon(x). Set a maximum deflection, and find a single-objective minimal fabrication cost over designs that satisfy the maximum deflection constraint. Set a maximum fabrication cost, and find a single-objective minimal deflection over designs that satisfy the fabrication cost constraint. Solve a multiobjective problem, visualizing the tradeoff between the two objectives. To use the multiobjective approach, which gives more information about the problem, set the objective function and nonlinear constraint function. Solve the problem using paretosearch with the 'psplotparetof' plot function. To reduce the amount of diagnostic display information, set the Display option to 'off'. For a smoother Pareto front, try using more points. This solution looks like a smoother curve, but it has a smaller extent of Objective 2. The solver takes over three times as many function evaluations when using 160 Pareto points instead of 60. To see if the solver makes a difference, try the gamultiobj solver on the problem. Set equivalent options as in the previous solution. 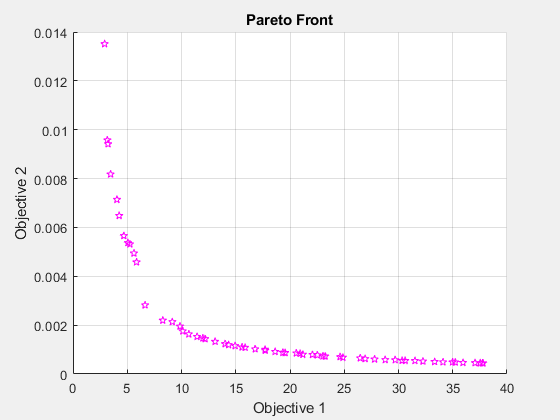 Because the gamultiobj solver keeps fewer than half of its solutions on the best Pareto front, use two times as many points as before. 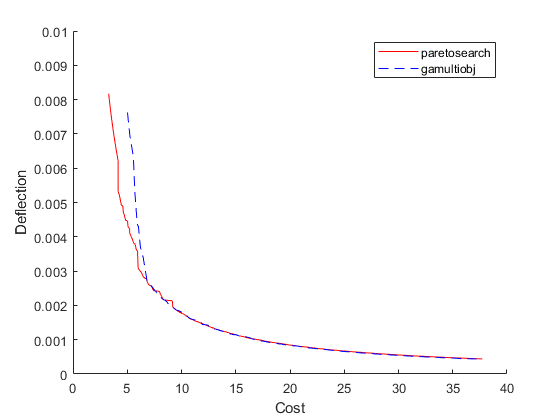 gamultiobj takes tens of thousands of function evaluations, whereas paretosearch takes only thousands. The gamultiobj solution seems to differ from the paretosearch solution, although it is difficult to tell because the plotted scales differ. Plot the two solutions on the same plot, using the same scale. The gamultiobj solution is better in the rightmost portion of the plot, whereas the paretosearch solution is better in the leftmost portion. paretosearch uses many fewer function evaluations to obtain its solution. 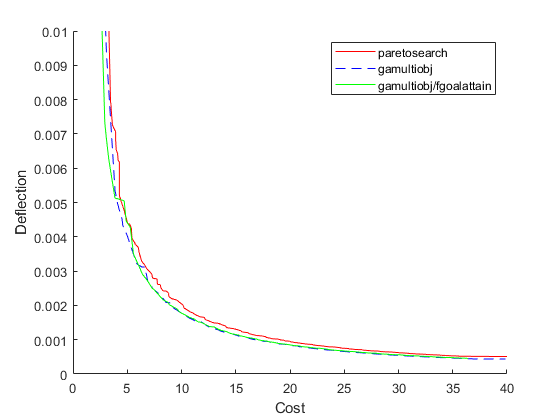 Typically, when the problem has no nonlinear constraints, paretosearch is at least as accurate as gamultiobj. 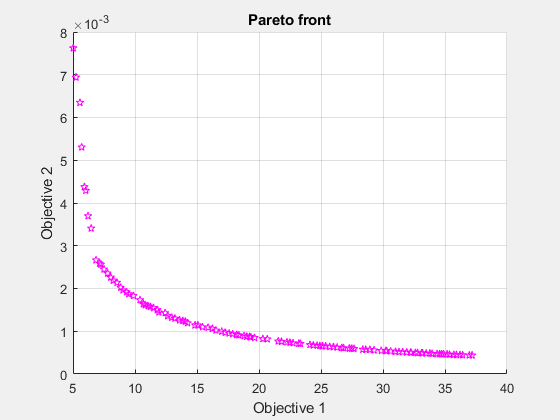 However, the resulting Pareto sets can have somewhat different ranges. In this case, the presence of a nonlinear constraint causes the paretosearch solution to be less accurate over part of the range. One of the main advantages of paretosearch is that it usually takes many fewer function evaluations. To help the solvers find better solutions, start them from points that are the solutions to minimizing the individual objective functions. The pickindex function returns a single objective from the objval function. Use fmincon to find single-objective optima. Then use those solutions as initial points for a multiobjective search. The minimum cost is 2.381, which gives a deflection of 0.158. The minimum deflection is 0.0004, which has a cost of 76.7253. The plotted curves are quite steep near the ends of their ranges, meaning you get much less deflection if you take a cost a bit above its minimum, or much less cost if you take a deflection a bit above its minimum. Start paretosearch from the single-objective solutions. Because you will plot the solutions later on the same plot, remove the paretosearch plot function. Start ga from the same initial points, and remove its plot function. Plot the solutions on the same axes. 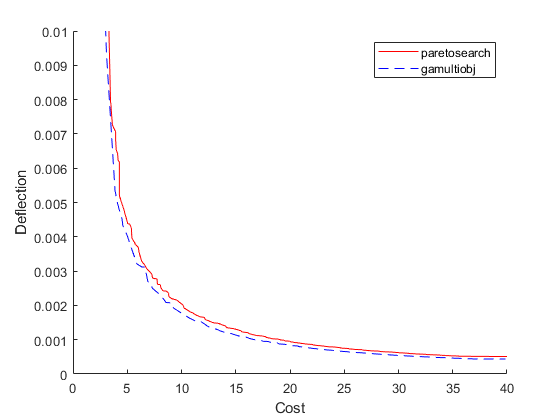 By starting from the single-objective solutions, the gamultiobj solution is slightly better than the paretosearch solution throughout the plotted range. However, gamultiobj takes almost ten times as many function evaluations to reach its solution. gamultiobj can call the hybrid function fgoalattain automatically to attempt to reach a more accurate solution. See whether the hybrid function improves the solution. The hybrid function provides a slight improvement on the gamultiobj solution, mainly in the leftmost part of the plot. Although paretosearch has no built-in hybrid function, you can improve the paretosearch solution by running fgoalattain from the paretosearch solution points. Create a goal and weights for fgoalattain by using the same setup for fgoalattain as described in gamultiobj Hybrid Function. The combination of paretosearch and fgoalattain creates the most accurate Pareto front. Zoom in to see. Even with the extra fgoalattain computations, the total function count for the combination is less than half of the function count for the gamultiobj solution alone. Total function count for gamultiobj alone is 46721. For paretosearch and fgoalattain together it is 18374. The plotted points show the best values in function space. To determine which parameters achieve these function values, find the size of the beam and size of the weld in order to get a particular cost/deflection point. 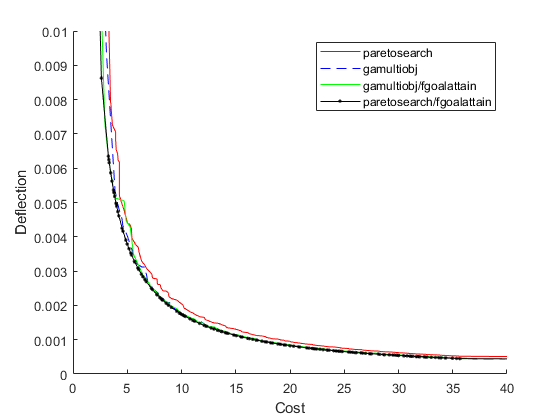 For example, the plot of paretosearch followed by fgoalattain shows points with a cost of about 6 and a deflection of about 3.5e–3. Determine the sizes of the beam and weld that achieve these points. Ray, T., and K. M. Liew. A Swarm Metaphor for Multiobjective Design Optimization. Engineering Optimization 34, 2002, pp.141–153.